Successfully Added Premium Dolby 5.1 Wireless Digital Headphones to your Shopping Cart. Premium Dolby 5.1 surround sound wireless headphones with advanced charging base/transmission station. This brand new wireless stereo headset system is for use with your home theater, computer, or home entertainment electronics. Containing the latest is audio technologies, this wireless headset is capable of producing up to 5 virtual loudspeakers in the headphones to create a fully immersive personal surround sound experience. With Dolby headphone technology supporting Dolby digital and PrologicII, you can finally experience 5.1CH and uncompressed CD quality audio in a head set. These high performance wireless headphones are a must have for anyone with a home theater, computer media setup, or gamer. Without the need for wires, you can comfortably relax in your favorite chair while enjoying your personal entertainment. Each ear piece and the head grip itself are comfort padded with memory-retentive poly foam, allowing a perfect fit with maximum comfort while wearing for a few minutes or all night long. If you know high-end audio products, then you know Sony and Pioneer have a product similar to this unit. You may also have noticed that theirs will cost you 250-300 USD. With the CVSB-K07, what you have is a unit with all the same specs, but at a direct to you factory wholesale price. Enjoy the marvel of great wireless stereo surround sound, but don't be stuck with the retail mark-up! Do yourself a favor, order one now as your personal sample, then move on to bulk orders if you want to get some serious wholesale discounts that are sure to net you some serious profits on your internet store. The wireless headphones simulate 5.1 channel speakers to create high quality surround-sound like what you experience from a traditional home theater. Comfortable headphones with sealed ear design - the sound is so clear you will wonder how you lived without this headset. 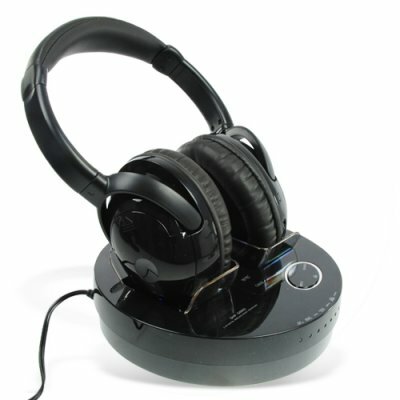 This system includes the wireless headphones, 2.4GHz RF digital transmission base with multiple input types, and Ni-MH rechargeable batteries.